With the 16 x 16 Microfiber Waffle Towel, its never been easier to clean up messes and dry surfaces! No streaks, spots, or smudges left behind. These lint-free towels are designed to absorb 7x their own weight in liquid, saving time spent cleaning. Scrub away messes with this cloth, too! Skip the chemical cleaning products and just use warm water to get the job done. 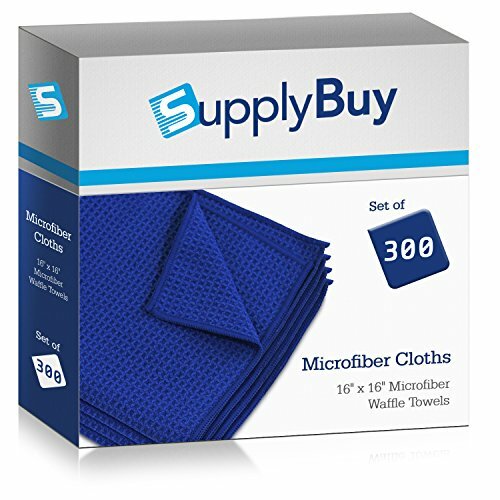 Pack of 300 - SupplyBuy Microfiber Waffle Weave Towels 16x16. Scrubs away dust and dirt from surfaces in your home, office, and car. Dries faster than a conventional cloth, leaving no streaks, spots, or smudges behind. Lasts through up to 500 of washes. Reuse again and again! Ideal for home and business use. Use anywhere you like! If you have any questions about this product by SupplyBuy, contact us by completing and submitting the form below. If you are looking for a specif part number, please include it with your message.